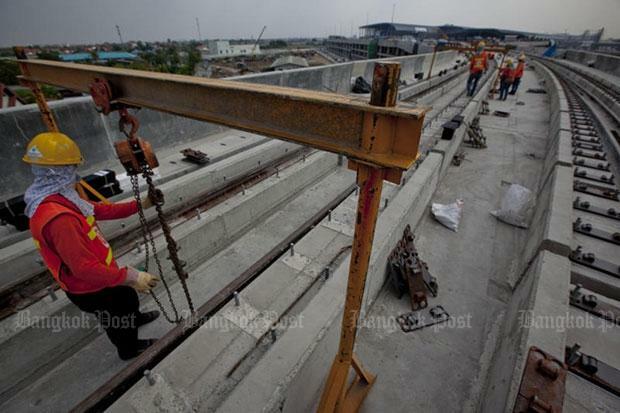 Construction of the Orange Line electric rail route, linking the Thailand Cultural Centre and Bangkok’s Min Buri district, may start ahead of schedule as giant construction companies have recently won the bidding for the state project. If no issues surface during further negotiations with the winning bidders, a contract-signing ceremony is expected to be held in February or March next year, Phakkhaphong Sirikantharamat, deputy governor of the Mass Rapid Transit Authority of Thailand (MRTA), which owns the project, said on Friday. Further talks are expected to be concluded in the middle of next month, followed by a meeting of the MRTA board to approve the contracts, he said. CKST Joint Venture, which comprises CH Karnchang Plc and Sino-Thai Engineering and Construction Plc, and Italian-Thai Development Plc and Unique Engineering and Construction Co have won five contracts for the construction of the 23km rail system — which combines a subway and an elevated track — worth more than 80 billion baht. According to the bidding results, CKST Joint Venture won the first and second contracts — the construction of a section of a subway starting from the Thailand Cultural Centre to Ramkhamhaeng Soi 12 and Hua Mak — after they tendered the lowest bids. Italian-Thai Development Plc was awarded another underground section in the third contract, connecting Hua Mak with Khlong Ban Ma on Ramkhamhaeng Road. Unique Engineering and Construction Co won the fourth contract to build a section of the elevated track stretching from Khlong Ban Ma to Suwinthawong Road in Min Buri. The company also won the fifth contract to install the rail system for the eastern part of the Orange Line. Bidding on a sixth contract opens next week.